Interested in becoming an Oliver's Candies Wholesaler? Please email us @ info@oliverscandies.com to complete the application process. FUTURE PRICE CHANGES: YOU WILL BE NOTIFIED VERBALLY OR WRITTEN NOTICE OR BOTH 30 DAYS BEFORE ANY PRICE CHANGE GOES INTO EFFECT. Oliver's Candies will provide each of our customers with a sign for hanging or window display. We will include your business in any advertising that might overlap your area whenever possible or applicable. Your business will also be included on our website as a point of purchase. We will also mention our affiliates on our social media. 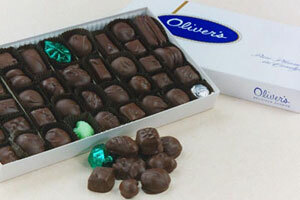 All Holiday price lists and updates from Oliver's Candies will be emailed. This is our preferred method. If you prefer a mailed hard copy, please let us know as soon as possible. As this is a preferred method of communication to deliver content, please make sure that Oliver's Candies has a current email address for you on file and that we are on your accepted list of your inbox (this way important information doesn't end up in the bulk/spam mail box). In order to establish a smooth order and delivery system to all wholesale accounts we have developed a few guidelines to follow while placing your orders. No orders will be taken 5 days prior to any holiday. Orders will require 72 hours minimum lead time to pick up time. Christmas, Valentine's Day or Easter. We can fill your containers: baskets, mugs etc. Custom orders welcome. packaging and gel packs. Delivery is available by previous arrangement only. RETURNS: All products are sold on a non-returnable basis unless damaged or defective. Refused orders and merchandise returned due to customer error are subject to a 10% restocking fee. Adding to an order must be done prior to the pick-up date. Last minute additions at time of pick up will not be accepted. If you choose to add items at time of pick-up, a new order must be started. Placing orders is easy. Our preferred method would be email: info@oliverscandies.com. Second preferred method is fax: 585-343-2453 and third would be via phone: 585-343-5888. When sending orders via email or fax there is less room for error in communication or interpretation. Thank you for your cooperation in following these policies which will help us to fill your orders quickly and efficiently.